The Emergency Medical Sciences program is now accepting applications for the fall with a deadline of May 6, said Ron Feller, program director. Feller said this is the first year students are required to apply, so he wants to be sure prospective students know about the change. Students interested in applying for the program should have a 2.5 GPA at the time of application and must maintain a 3.0 in all of the courses in order to remain in the program, Feller said. A $25 fee is due at the time of application. 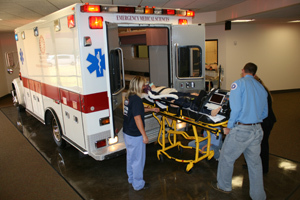 The number of EMS graduates varies each year. This spring the program will have 21 candidates for graduation, Feller said. On average there are between 15 to 20 graduates annually from the program. Students also can become eligible for the program by taking an EMT, Emergency Medical Technician course. This one-semester course can be taken at OCCC along with Anatomy and Physiology I. Taking these two courses at the same time immediately makes students eligible for the program, Feller said. Anatomy and Physiology I is not a requirement for EMS; however, it adds value, Feller added. Students who are considering the EMS program are urged to apply either in person with the director or online. The EMS has two separate programs. One is for a yearlong Certificate of Mastery program and the other is a two-year Associate in Applied Sciences degree program. The EMS Program originally started at OCCC in 1972, Feller said. OCCC offers three sections a year, traditional and hybrid, two of which are offered in the fall. In the traditional section, classes are held once or twice in the week. In the hybrid section, all didactics are done online and students come in every other week for labs, Feller said. Applications for spring will be taken during the fall semester. Students interested in applying to the program online can access the home page on the OCCC website and, in the search engine located at the top right hand corner, type in Health Professions. Feller said all of the information they seek would be located on that page. After students have successfully completed their degree program at OCCC, they take a National Registry Exam. There are two phases to this exam, Feller said. The pass rate is 96 percent for OCCC students taking the exam for the first time. Once this exam has been successfully completed, Feller said, graduates will then become nationally registered paramedics, after which they will apply for a state license. Once the exam has been taken, the results are normally available the same day or the next day after testing, Feller said. If for some reason a student should not pass, there is a 15-day waiting period before the student would be eligible to re-test. Feller said OCCC offers a scholarship for graduates that pays for all of their testing and state licensing fees for a total amount of $318. Feller said he is happy to speak with interested students regarding this program. Feller’s office is located in the Health Profession building in room 201. To contact him, reach 405-682-1611 ext. 7343 and his email is ronald.l.feller@occc.edu.